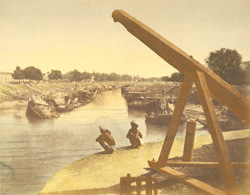 bl.uk > Online Gallery Home	> Online exhibitions	> Asia, Pacific and Africa Collections	> Circular Canal, Calcutta. A hand-coloured print of the circular canal, Calcutta, from the Fiebig Collection: Views of Calcutta and Surrounding Districts, taken by Frederick Fiebig in 1851. This is a view of scenery and boats along the circular canal at Calcutta. The circular canal ran to the east and north of the city, draining the salt lake and finally connecting with the River Hooghly at Chitpore.